[Stride]-Stride Step-[Choose one or more cards with the sum of their grades being 3 or greater from your hand, and discard them] Stride this card on your (VC) from face down. [AUTO](VC):[Soul Blast (1) & Choose a face down card from your G zone, and turn it face up] When your rear-guard [Stand], you may pay the cost. If you do, that unit and this unit get [Power]+5000 until end of turn. 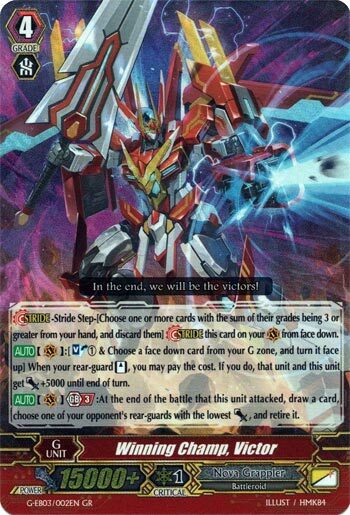 [AUTO](VC) Generation Break 3:At the end of the battle that this unit attacked, draw a card, choose one of your opponent’s rear-guards with the least [Power], and retire it. So apparently we don’t love Great Nature enough to review any of its new toys. Okay, that’s fine. The new Star Gate Nation Booster easily gave Nova Grapplers all the toys it needs to be the new best deck of the meta. I am not speaking hyperbole, and I know I basically communicate in that. Winning Champ Viktor here is basically your only first Stride that even matters anymore. Every time you stand a rear-guard, you pay an easy 1 soul to flip Meteorkaiser Bustered or the Sebreeze you won’t need anymore to proc an easy GB3 and retire something weak. The entire deck is now Thavas except with more answers to the matchups Thavas hates. RULING: If the weakest unit on the board can’t die because of something like Resist, you do NOT default to the second weakest. It just means nothing gets retired. Keep in mind, this would actually be nowhere near as good as it is now without Zubat Battler Viktor recouping resources. Without him this would be a one-shot wonder that would have cut into Excessive Viktor. A monster that will cause you problems.